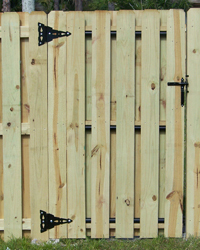 We supply all types and styles of wood fence. The most popular styles are Vertical Shadowbox, Board-On-Board, and Stockade. All provide privacy and security. The types of wood that are most popular are Pressure Treated Pine, Cypress, and Cedar. There advantages and disadvantages as to which species of wood to use in South Florida. Please feel free to call us and ask about these differences. 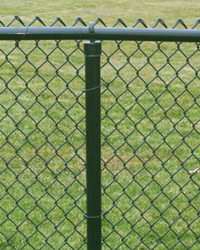 Chainlink fence can be used for a number of things but most common is security or keeping animals in or out. It is the most economical way of fencing property in. There are many different gauges of chainlink fabric and many diameters of pipe frame. Chainlink also comes in many different colors; black, brown, green, and galvanized. Please feel free to call us. Aluminum Fence is a great way to enhance the beauty and style of your property. It also provides security and added value to your home or business. 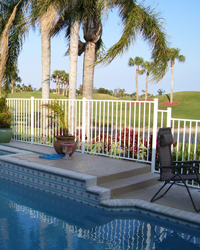 Aluminum Fence will last the longest in a salty environment and makes a wonderful pool fence. This type of fence has a powder-coated finish that has a guarantee from the manufacturers that have been in the industry for over 50 years. There are many styles and colors to choose from. We manufacture our own aluminum gates to meet your needs. Please call us for prices and options. We provide access controls for any property that has a gate. 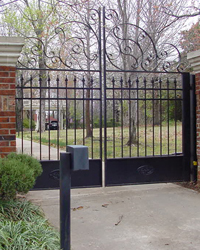 We custom build all of our gates and can install the gate operators which includes telephone entry, safety features that keep the gate from closing on a vehicle or person, remote access, wireless intercoms, and lightening protection. There are many more options, styles, and types to choose from. Please contact us to purchase your gate access control. 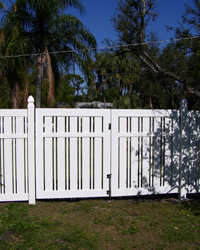 PVC Fence comes in many styles and colors ranging from semi-private to private. It also comes in ornamental pickets and requires very little maintenance to keep it clean. It is a very popular fence type due to the beauty, no warping of boards, no staining, no splitting posts, and no painting. If you are looking for a very low maintenance fence, then this is the fence for you. 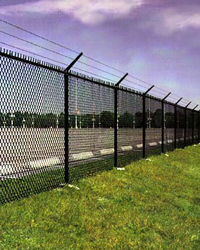 The Industrial and Commercial Chainlink Fence is a major part of our business which includes parks, schools, baseball fields, soccer fields, tennis courts, and ports. The ball fields have 30-40 feet high backstops, golf course driving ranges with netting as high as 80 feet, and we have built zoo enclosures. We have the capability to build fence around almost anything that comes your way. We have fenced in Coast Guard Stations, Airports, and Prisons. Please give us a call to build your fence. Daniels Fence is proud to serve the entire Treasure Coast, including Stuart, Jupiter, Hobe Sound, North Palm Beach, Port St. Lucie and the surrounding areas.